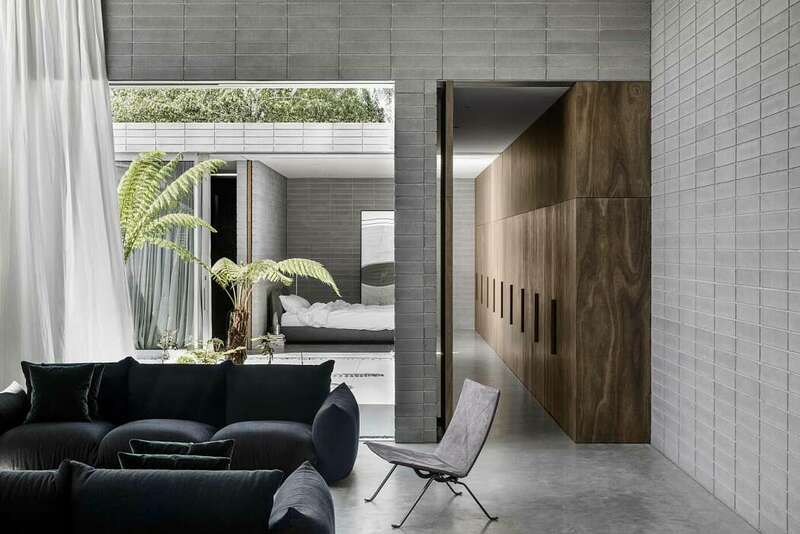 Redesigned and extended in 2017 by Ritz&Ghougassian, this inspiring single family house is located in Melbourne, Australia. Highbury Grove is defined by a street frontage of uniform federation style cottages set in orthogonal rows and folded in amongst leafy suburban gardens. The project was required to deal with the heritage street frontage and a lane way to the northern side of the property. The project responds by creating an architectural envelope that orientates to the north whilst providing privacy to the public laneway. The original character and detailed heritage front is expressed as a singular white silhouette. Spotted gum floors replaced a decaying timber flooring structure, whilst neglected fireplaces, previously stripped of their ornamentation are cleaned up and new hearths are placed at their feet. The connection between the heritage architecture and the new addition is expressed as a singular moment cast in shadow. The user is squeezed into close contact with the concrete walls, causing a shortness of breath before a step up into a large hollow volume of open air and light. A catharsis for the senses.